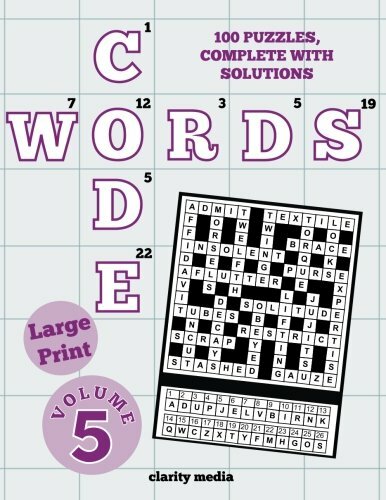 Welcome to this fantastic collection of 100 brand new codeword puzzles, in large print. - Each letter from A - Z has been replaced with a number from 1 - 26. - You need to work out which number represents each letter of the alphabet. - Every letter appears in the grid and is represented by just one number. For instance, the number 20 might represent the letter 'S', which would mean you could write an 'S' into every square in the grid that contains the number 20. The aim of the puzzle is to crack the code for every letter and therefore complete a valid crossword grid. You'll need a good vocabulary and astute knowledge of English to be able to crack these puzzles. There is one puzzle per page and full solutions at the back so you can check your answers, or seek assistance if you need it. You are given a few clue letters for each puzzle to get you started; from there on it's up to you! All of our puzzles are printed on very high quality paper, making the puzzle experience all the more enjoyable! For other puzzle books, visit our www.puzzle-book.co.uk page.